Join Perkiomen in celebrating an American icon, Walt Disney World and attractions. We have teamed up with Disney World to offer our customers the most convenient and the best opportunity for family fun. Choose from two of Walt Disney World Resorts. All Star Movies Resort - Discover the fun, adventure and romance of this enchanting destination that celebreates the magic of the movies. Cool off in the enchanting Fantasia Pool. Relax with a bite, brew or your favorite beverage at the Silver Screen Spirits Pool Bar. End the day with Movies under the stars. Port Orleans Resort, French Quarter - Stroll cobblestone walkways and gaze down from balconies with delicate railings as you listen to the smooth jazz backdrop and breathe in the sweet smell of magnolia blossoms in the air. As you pass by the ornate street signs, antique gas lampposts and fountains, you may just feel like you've been transported to The Big Easy. Please note: Baggage Handling is not available at Disney's Resorts. Look forward to excitement ahead as we travel to our first night's lodging in Fayetteville, North Carolina. Florida, the sunshine state, bids us welcome as we travel to our lodging for the next six nights conveniently located right in Walt Disney World Village, Lake Buena Vista, Florida. 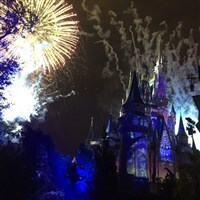 Your visit to Walt Disney World includes a 5 Day Park Hopper Pass with free use of the Disney transportation system plus daily admission to each of the four Disney theme areas: Animal Kingdom, Hollywood Studios, Epcot Center and the Magic Kingdom. Those who wish, are free to use available public transportation to visit other Orlando attractions on their own. This morning we must depart for home. Our final overnight will be in Fayetteville, North Carolina. Our arrival home tomorrow will be by early evening.